The Heartbeats At Home Fetal Doppler is one of the most advanced Fetal Dopplers available on the market today. The Fetal Doppler (also known as a Fetal Heart Monitor) uses broad beam ultrasound technology and a pre-angled probe allowing for greater ease in locating the heartbeat with optimal clarity. The unit is lightweight, easy to handle, extremely durable, and has dual speakers. The unit weighs 13.8 ounces and operates on one 9-volt alkaline battery. 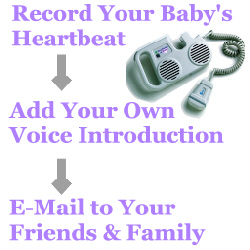 One of the most important parts of any Fetal Doppler is the sound output. Our Fetal Heart Monitor uses Static Suppression Doppler (SSD) technology to provide a crystal clear static-free signal and maximum clarity. To get a sense for the heartbeat sounds you can expect to hear, we’ve provided a few sample audio clips below. A word about safety…Ultrasonic Dopplers have been in use since the late 1950's to detect the fetal heartbeats in earlier stages of pregnancy, long before an ordinary stethoscope. It is important to note that there are no known reports of any adverse biological or health effects from the use of our Fetal Dopplers. With your doctor’s approval, the FDA has cleared the in-home use of Heartbeats At Home Fetal Dopplers to listen to the baby's heartbeat during pregnancy. The fetal heartbeat is much faster than an adult heartbeat and sounds similar to the "clippity-clop" of a galloping horse. With this doppler the fetal heartbeat can be heard as early as 10 weeks into the pregnancy. Lastly, the external port allows you to connect the Fetal Doppler to headphones or even your PC for digital recording. Once you’ve captured the heartbeat in the form of a .wav file on your PC, you can easily attach the sound file to an E-Mail and send it over the internet.